This product is no longer available and has been replaced by: CS320. The LI200RX pyranometer measures both sun and sky solar radiation with a silicon photovoltaic detector mounted in a cosine-corrected head. The cable contains circuitry that standardizes sensor calibration, allowing complete sensors and cabling to be swapped out in the field without having to change the data logger programming. This pyranometer connects directly to Campbell Scientific data loggers and is ideal for agricultural and meteorological applications. The LI200RX is calibrated for natural light. Campbell Scientific does not recommend using the LI200RX under artificial light or plant canopy. The LI200RX pyranometer monitors sun plus sky radiation. It connects directly to Campbell Scientific data loggers and is used extensively in solar, agricultural, and meteorological applications. 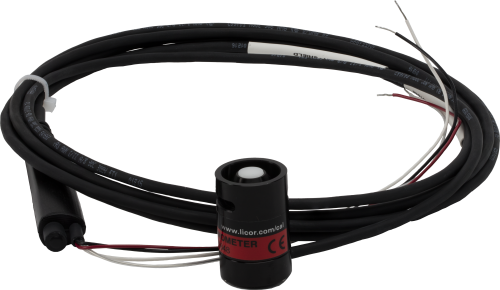 This pyranometer includes a completion circuit in its cable that standardizes calibration, allowing complete sensors and cabling to be interchanged without altering multiplier and offset values. The LI200RX sensor head is calibrated against an Eppley Precision Spectral Pyranometer to accurately measure sun plus sky radiation. Campbell Scientific does not recommend using the LI200RX under vegetation or artificial lights because it is calibrated for the daylight spectrum (400 to 1100 nm). The overmolding that protects the completion circuit in the cable of the LI200RX may crack if temperatures drop below -40°C. To ensure accurate measurements, the sensor should be leveled using an LI2003S leveling fixture, which incorporates a bubble level and three adjusting screws. The LI2003S leveling fixture mounts to a tripod or tower using the CM225 mount. Campbell Scientific recommends mounting the LI200RX-L away from all obstructions and reflective surfaces that might adversely affect the measurement. The LI200RX-L requires one differential analog input channel per probe.